Walk down Shelby Street south from the vibrant main drag of Nulu and it hits you pretty quick: once you’re past Nanny Goat Strut Alley, you’re pretty much in a no-man’s land. The street life dries up off East Market Street and past Jefferson Street, so do any buildings. The entire area is a wide expanse of barren lots creating a palpable chasm between Phoenix Hill, Nulu, and the Medical Center. But this summer, City Collaborative is bringing ingenuity, shipping containers, and a healthy dose of tactical urbanism to the area with hopes of implanting a civic heart in the center of this otherwise challenging urban landscape. 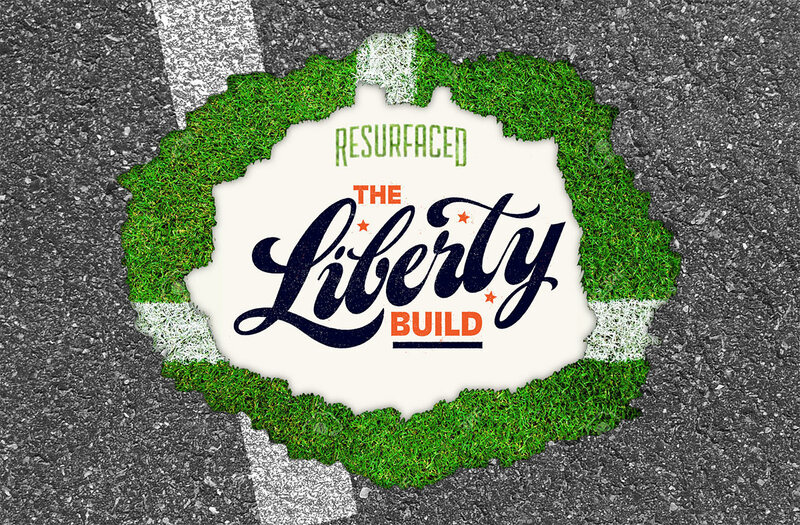 Meet ReSurfaced: The Liberty Build. Scheduled to last 18 months or more—the most ambitious ReSurfaced yet—the Liberty Build will be located on a three-quarter-acre lot on the northwest corner of Liberty Street and Shelby Street that has been vacant since 2003. The project is, above all, a public commons that aims to knit together the three neighborhoods and bring life—for at least three days a week—to a forgotten patch of grass. 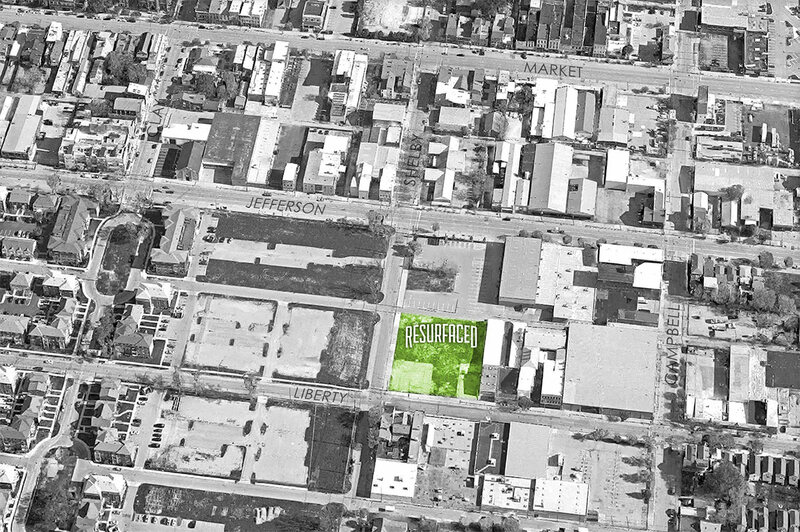 The Liberty Street site was chosen specifically for its design challenges as an opportunity to push the achievements of the ReSurfaced program further in terms of creating “a community activation space that fosters civic engagement and entrepreneurialism.” As a public commons, the site hopes to knit together various aspects of food and drink Louisville has come to love from past events with entrepreneurship and new ways of public engagement. That means everything from co-working spaces to makerspaces are on the table. The Liberty Build will be realized in two phases, the first a two-week session this summer running Thursdays through Saturdays from June 2 through June 11th focused on kickstarting a full rollout this September, also running Thursdays through Saturdays. Because of the complicated site limitations, designing and programming the Liberty Build is crucial. Previous iterations of ReSurfaced featured space-defining elements such as brick walls or sweeping vistas along the Ohio River, but the Liberty Build had to get down to the nitty-gritty of place making on a blank slate. To accomplish this, an armature of shipping containers, some stacked, will form an active perimeter that defines a plaza space. 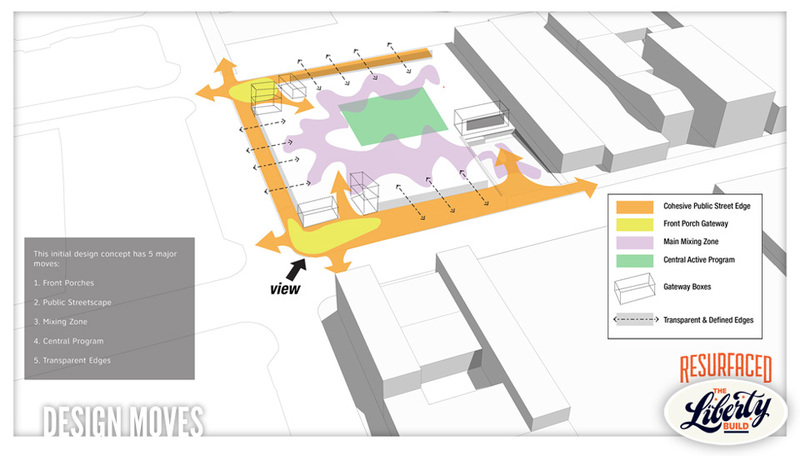 The first phase will create a porous armature of shipping containers around site defining a central commons filled with picnic tables. 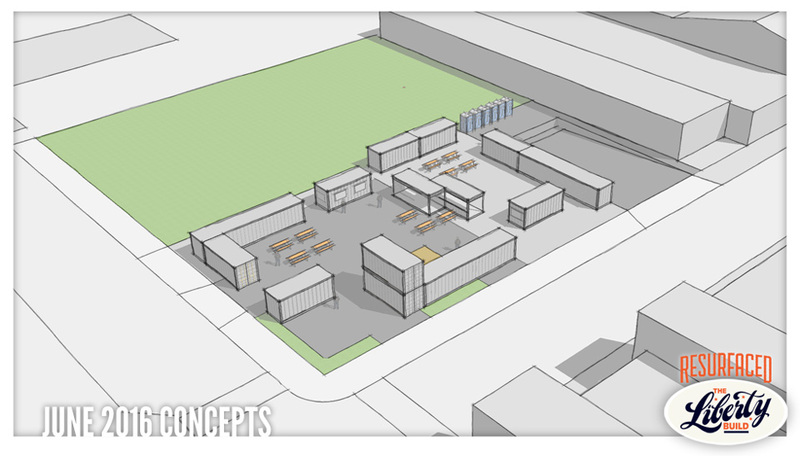 These containers will provide new models of retail space that allow entrepreneurs to experiment with their goods and products, focused primarily on a beer garden concept with food. 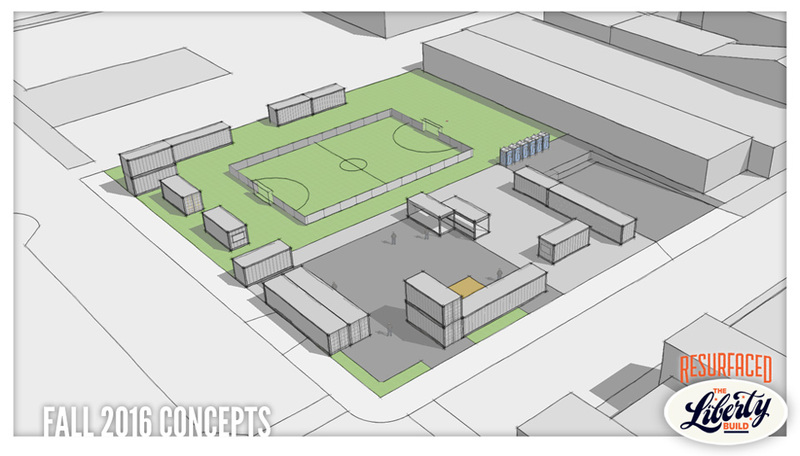 The second phase expands the site with a basketball-court-sized soccer pitch—called a Five-A-Side pitch—paved with artificial turf and framed by additional shipping containers (more on that soon). During this phase, an expanded program of co-working and studio space, retail, and a community workshop will also be explored. City Collaborative hopes to build off international connections it made last year with England’s De Montfort University to also include a studio space where students and staff from that school will focus on Education and Health & Wellness in Louisville. ReSurfaced: The Liberty Build will constantly be changing. Expect to see sustainability, new ideas about retail space, plentiful events, and lots of opportunities for art (Metro Louisville’s Committee on Public Art is a partner) abounding at ReSurfaced: The Liberty Build. Already planned are live-painting events, art installations, and kinetic art displays. Makerspaces LVL1 and FirstBuild will also tinker with how we use public space, helping ReSurfaced to evolve over its 18 month run. The scale and ambition of ReSurfaced: The Liberty Build deservedly put the initiative in the same realm of some of the top shipping-container focused pop-up urbanism projects including the former Dekalb Market in Brooklyn, Brixton Pop in England, and Proxy in San Francisco. And while today the site surrounding ReSurfaced: The Liberty Build looks like it’s been cleared for urban renewal, the site will some day, years from now, be a vital stretch connecting south from Nulu, which is trying its hardest to break free from its linear commercial corridor past. The Rabbit Hole Distillery will help break that mold, as will Bill Weyland’s renovation of the Louisville Chemical Building and planned hotel over on Hancock Street. 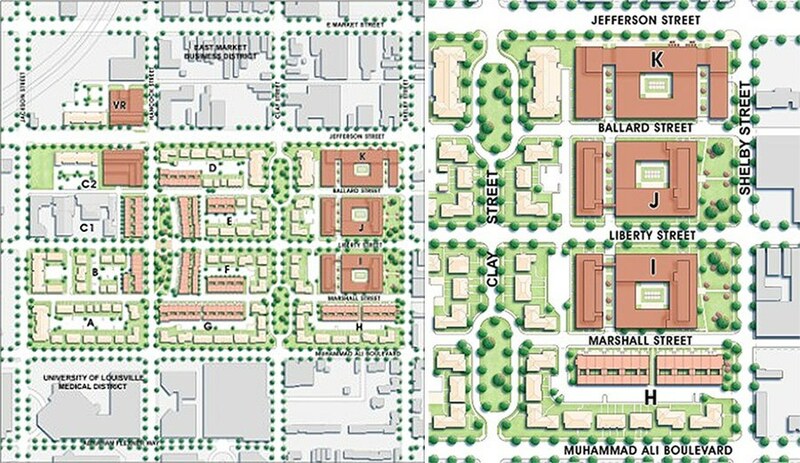 But most significantly, the eastward, privately-developed expansion of Liberty Green will will the north-south Shelby corridor with large-scale apartment buildings, hopefully carefully designed with appropriate retail space and good urbanism that will help bring vitality back to the area. In the meantime, the area is getting a temporary heart and we can’t wait to see how an infusion of activity here will help the entire area come back to life. See you at the Liberty Build! Walking north on Shelby from NuLu you run into the ramp of the Big Four Walking Bridge (5 short blocks). Once the highway work is done that should be an exciting corridor from the Bridge to NuLu and to Liberty Build!!!!! The designs could be so much better!! Using containers.. Doesn’t always have to look exactly like the containers sitting in the storage yard.. Think Beuatifucation with the Spaces!! It’s a blessing to get the land, why not make it the best design possible!! feeling a tad conflicted here. I believe this is the old recreation block to the former Clarksdale Housing Projects(basketball courts, cookouts, picnic tables, etc.). I shot a lot of footage here just a few years ago. It was always a very lively area. Real human activity. Struggling with this one. It is not the recreation block to the former Clarksdale Public Housing. it is the former Blatz Paint lot across the street from Clarksdale. I am upset about the language used in the article “no man’s land” and “wide expanse of barren lots” making it sound like this project is the savior of this abandoned neighborhood. The large lots that are referred to are owned by the Louisville Metro Housing Authority, and if they had stuck with the original plans approved by the Neighborhood Association, then this no-man’s land would be filled with single-family homes that would have long ago been sold and lived in, and the neighborhood would not have these barren lots. Please correct your language in any future articles, and please put the responsibility for these barren lots where it belongs, with the Louisville Metro Housing Authority. What I forgot to state in the previous comment is that the Phoenix Hill Neighborhood Association is a very active association, which has worked for 40 years to get rid of abandoned and vacant lots in the neighborhood. This work has included the first Affordable Housing Homearama held in this city, in which all of the houses sold before the end of the Homearama. We have developed over 50 single-family homes in the neighborhood. It has been a frustration of ours that these lots referred to in the article have been vacant for so long. 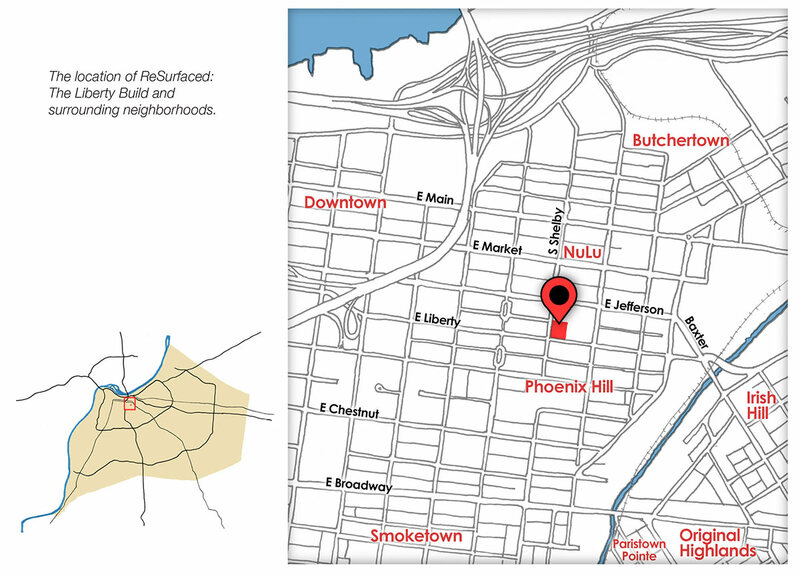 The Phoenix Hill neighborhood is a great place to live and work. This new ReSurfaced project is just one more exciting thing in the neighborhood. @Cindy: You’re right that plans changed and this was supposed to be built up already, but that’s how it goes sometimes with recessions and public funding. Doesn’t make it right, but we are where we are. The article clearly shows what was planned on this site. In that light, there’s no other way to describe the current situation here as an expanse of barren fields and I stick by that observation. Not sure why you’re upset with this project as trying to help—I certainly hope it pushes the needle. The PHNA is certainly a guiding light in the neighborhood and I wish only the best for the area to redevelop and knit together a fraying urban fabric.